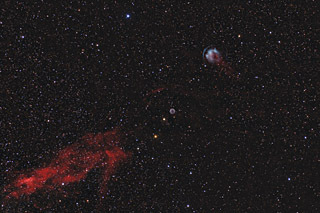 HFG1 (Heckathorn-Fesen-Gull 1) and Abell 6 make for a fascinating pair of planetary nebulae (PN). Abell 6 (PK 136+04.1) is in the center of the image and has the bubble look of typical PNs. As can be common, the PN has a blue/green look from ionization of OIII. Abell 6 has a fairly strong Ha component as well. 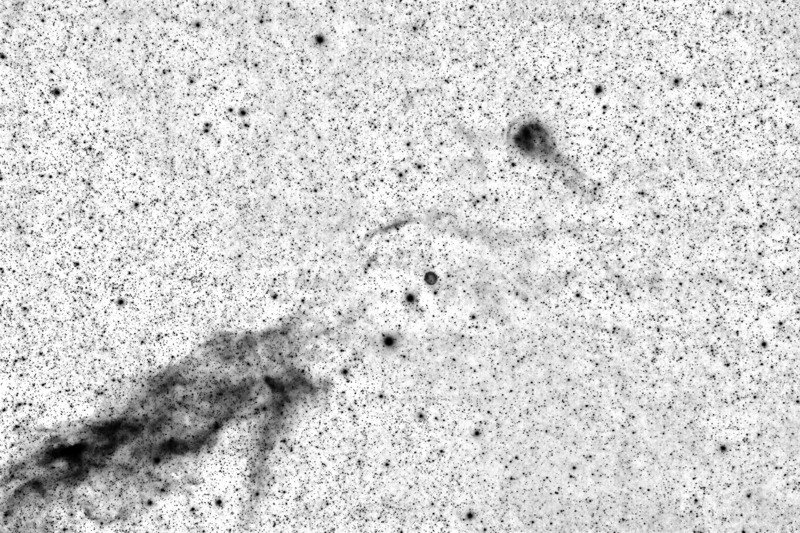 Discovered in 1982, HFG1 (PK 136+05) is towards the upper right of this astrophoto, and it has a more complex morphology. The planetary nebula is formed from the binary star, V664. The binary system is comprised of a white dwarf (compact, small star), and a large red giant star. The two stars are very close and rotate about each other in just 14 hours. As the PN moves through the interstellar medium at a very high speed, it creates an OIII bow shock (seen at the 10 o'clock position in this image), just like a boat plowing through the water. Behind the PN at the 4 o'clock position, there is a "wake" of material that is about 1/3 of a degree long, shining red from the excitation of Hydrogen gas. This is the Inverted Ha version of this image. I also have a full color HaOIIIRGB version of this image along with an Inverted OIII version. In this image, North is to the Right. This image was cropped to 96% of the original frame. Software Used Images Plus 6.0 for camera control. Images Plus 6.5 for calibration, stacking, ArcSinH stretching, star size reduction, smoothing and noise reduction, feature mask, edge mask extraction, and masked stretching. Photoshop CS5 used for levels and curves, screen mask invert, and high pass filter. Gradient Xterminator for gradient removal. Carboni Tools for additional noise reduction and smoothing. Registar 64 for subexposure alignment. Pixinsight 1.8 for star mask generation. Notes I learned about this particular target from a posting on the CCD Forum of Cloudy Nights. It was on a list one of the members had generated of "Advanced Narrowband Imaging Targets". The author described the list as "really for CCD imaging" (i.e., not appropriate for a DSLR). Of the 20 objects on the list, I had already photographed 4 of them! I decided that this one looked like it would fit the field of view of my 600mm lens well, so I had to accept the challenge. I'm very happy with the final result. The field certainly ended up being quite challenging to photograph and process, so I can understand why many would feel that a CCD is a better platform for imaging it. Nonetheless, I think I was able to capture the field of view rather nicely with my DSLR.